I have been passionate about drawing and painting since early childhood and I’ve never met a medium I didn't like. At last count, I’ve tried at least 325 mediums & combinations. 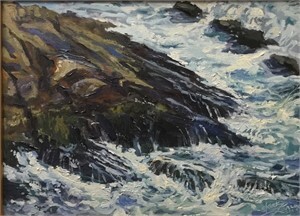 My work ranges from oil painting “en plein air” to studio maritime work., LIVE acrylic fusion paintings and all forms of sculpture. I continue to gain international recognition as one the premier artists painting in major Plein air events. 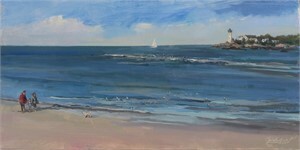 I enjoy the camaraderie, competition and creativity they inspire and the paintings are great too! I’ve had over 60 solo shows and a multitude of juried art shows with works in museum and private collections across the country England, Ireland, Russia, Germany, Netherlands, Estonia, Curacao and China. I’m the resident Live painter at Islip Art Museum, painting at art museum events capturing the atmosphere and the event as it takes place. A LIVE ART FUSIONIST, my acrylic works continue to wow audiences & garner great press. 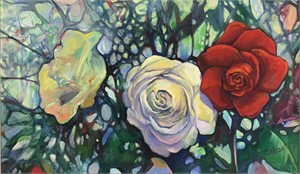 I was recently flown to LA by a famous actress to paint her daughter’s wedding LIVE. It was a great success. As an avid sailor, classic, modern and one design yacht racing has fueled my inspiration of fascinating nautical and maritime artworks. 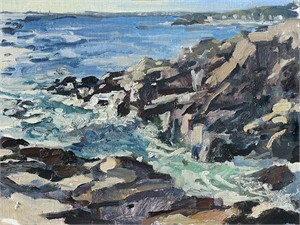 My art was featured in the Mystic Seaport museum of America and the Sea exhibition “Modern Masterpiece – 30 Years of the Museum Purchase Award”, and I have been selected for exhibit in the Mystic Seaport Gallery's 31st, 32nd, 33rd, 34th, 36th and 37th annual “International Maritime art shows” respectively, Quinlan Arts center museum show “Southern Waters" and my painting “Skimmer vs. IVRE” was included in a 22 month, 8 museum, national tour as part of the American Society of Marine Artists “Contemporary American Marine Art” show. I’ve developed a teaching method that accelerates the learning curve in art; a Professor at the Parsons New School University School of Design Strategies, an associate of The School of Fashion Design, a film and television actor SAG–AFTRA; mentor & motivational speaker; I am a musician, a gourmet cook and an award winning published a writer of short stories, screenplays, essays and poetry not surprisingly much of it about sailing and the sea. In 2015 I was nominated for Poet laureate of Nassau County. 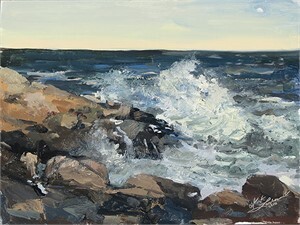 Member of Salmagundi Club NYC, OPA: The Oil Painters of America, ASMA: American Society of Marine Artists, AIS: The American Impressionist Society, MAPAPA: Mid Atlantic Plein Air Painters Association, NYPAP: New York State Plein Air Painters. I am the recipient of over 134 awards for painting in oils, acrylic, watercolors, gouache, drawing, colored pencil, mixed media, pen & ink, photography and sculpture – for portraits, still life, landscapes and abstraction. 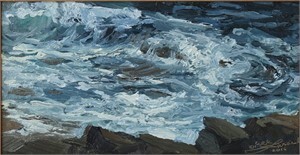 View more of Kirk Larsen's Paintings on our marketplace. Kirk Larsen “ When painting…everything is right with the world ” “ When painting, I have the feeling that all is right with world. 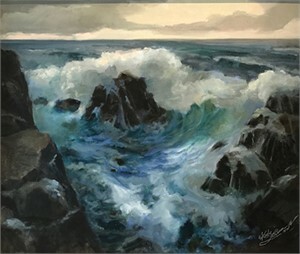 Those that have my art on the walls, say it has the same effect… ” — Kirk Larsen I have been passionate about drawing and painting since early childhood and I’ve never met a medium I didn't like. At last count, I’ve tried at least 325 mediums & combinations. 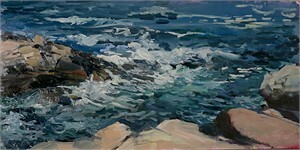 My work ranges from oil painting “en plein air” to studio maritime work., LIVE acrylic fusion paintings and all forms of sculpture. 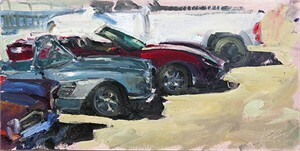 I continue to gain international recognition as one the premier artists painting in major Plein air events. 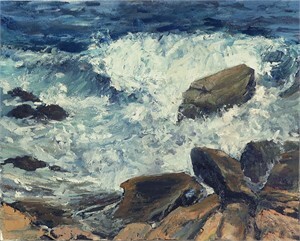 I enjoy the camaraderie, competition and creativity they inspire and the paintings are great too! I’ve had over 60 solo shows and a multitude of juried art shows with works in museum and private collections across the country England, Ireland, Russia, Germany, Netherlands, Estonia, Curacao and China. I’m the resident Live painter at Islip Art Museum, painting at art museum events capturing the atmosphere and the event as it takes place. A LIVE ART FUSIONIST, my acrylic works continue to wow audiences & garner great press. I was recently flown to LA by a famous actress to paint her daughter’s wedding LIVE. It was a great success. As an avid sailor, classic, modern and one design yacht racing has fueled my inspiration of fascinating nautical and maritime artworks. 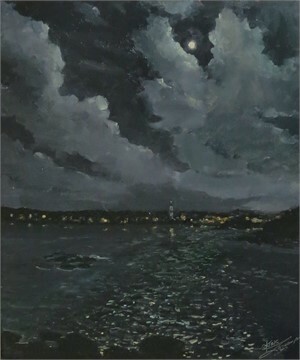 My art was featured in the Mystic Seaport museum of America and the Sea exhibition “Modern Masterpiece – 30 Years of the Museum Purchase Award”, and I have been selected for exhibit in the Mystic Seaport Gallery's 31st, 32nd, 33rd, 34th, 36th and 37th annual “International Maritime art shows” respectively, Quinlan Arts center museum show “Southern Waters" and my painting “Skimmer vs. IVRE” was included in a 22 month, 8 museum, national tour as part of the American Society of Marine Artists “Contemporary American Marine Art” show. I’ve developed a teaching method that accelerates the learning curve in art; a Professor at the Parsons New School University School of Design Strategies, an associate of The School of Fashion Design, a film and television actor SAG–AFTRA; mentor & motivational speaker; I am a musician, a gourmet cook and an award winning published a writer of short stories, screenplays, essays and poetry not surprisingly much of it about sailing and the sea. In 2015 I was nominated for Poet laureate of Nassau County. 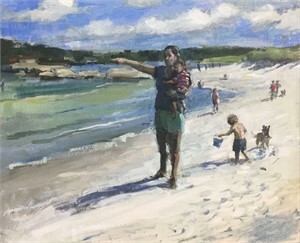 Member of Salmagundi Club NYC, OPA: The Oil Painters of America, ASMA: American Society of Marine Artists, AIS: The American Impressionist Society, MAPAPA: Mid Atlantic Plein Air Painters Association, NYPAP: New York State Plein Air Painters. I am the recipient of over 134 awards for painting in oils, acrylic, watercolors, gouache, drawing, colored pencil, mixed media, pen & ink, photography and sculpture – for portraits, still life, landscapes and abstraction. 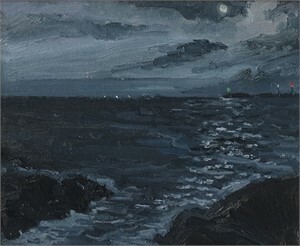 View more of Kirk Larsen's Paintings on our marketplace.